WHAT: We will plant a variety of native trees and shrubs in the riparian corridor to benefit the creek and the salmon that inhabit the Miller Walker Basin. WHEN: Saturday, October 27th, 9:30 a.m. -12:30 p.m. PLEASE RSVP: This helps us coordinate supplies and refreshments. Contact Matt Goehring at [email protected]  or (206) 263-6826 about any questions and/or to sign-up. Visit the Miller Walker Basin Volunteer Calendar  for more information. Bookmark and check back for program updates! 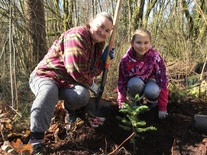 The Miller Walker Stewardship Program is a joint effort of the City of Burien , City of Normandy Park , City of SeaTac , King County , and the Port of Seattle .